An overcast sky failed to dampen spirits in White River Junction last Saturday. 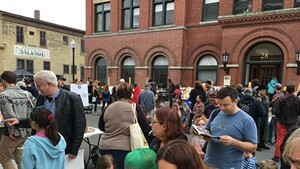 The Center for Cartoon Studies was hosting a 10th-anniversary block party that brought a stream of visitors to the middle of downtown. It was a joyous, all-ages affair: Little kids drew their own cartoons, played with cardboard pinball machines, painted at easels, lined up for free comic books and snacked on pizza and free cupcakes. The grown-ups did much the same — plus stood around talking, as adults do. The party took place one day after the school's 10th graduation ceremony, which featured a commencement talk by New York Times best-selling cartoonist Nate Powell. At the party, CCS cofounders Michelle Ollie and James Sturm wore nonstop happy faces as they mingled with friends and guests. Current students and interns made free buttons out of vintage comic books, staffed art tables and showed visitors around the Schulz Library in the school next door. On a small outdoor stage, CCS MFA graduate and now school faculty member Luke Howard played emcee, introducing a lineup of entertainers and speakers. Among the latter was longtime CCS board member Matt Dunne, who did not mention that he happens to be running for governor. In its first decade, the Center for Cartoon Studies has not only survived but thrived; it now offers one- and two-year programs as well as a master's of fine arts degree. Without question, the school has contributed greatly to the unique creative energy of this erstwhile sleepy railroad town. Actually, scratch "sleepy"; at one point, a rumbling, ground-shaking, whistling train passed nearby, serving as a reminder that trains still wake residents on a regular basis. Such late-night disturbances were among the reminiscences featured in "Pioneers," a simple black-and-white comic anthology created by five CCS first-year students and sold at the party for $3. The cartoonist contributors illustrated hardships they recalled from their time at the then-experimental school. Ross Wood Studlar, who is now a park ranger out west and draws comic books featuring animals, remembers walking home from his CCS classes "in 30 below zero, plus wind chill." Sean Morgan, now an illustrator and staff artist at Dime Entertainment magazine, candidly admits in his comic, "Booze gave me the courage to try things I wouldn't normally do creatively." Colleen Frakes lives in Seattle, where she's working on her sixth graphic novel. She writes, "The first year was tough! CCS didn't know what they were doing yet. We were in class 12 hours some days." The party occasioned a reunion not just for the early "pioneers" but for other alumni of CCS, who greeted one another with particular enthusiasm and camaraderie. "It's been like old home week," said Steve Bessette, a faculty member and himself a pioneer graduate of the Joe Kubert School of Cartoon and Graphic Art (now the Kubert School) in Dover, N.J. "At least 20 to 25 alumni have come back." Bessette's award-winning comics include Saga of the Swamp Thing (written by Alan Moore), and he has illustrated many fiction and nonfiction books. Fraternizing with Morgan and Studlar at the party, Bessette guessed that CCS has graduated "150 to 200 students at this point." Ben T. Matchstick, coinventor of the PinBox 3000, took a break from watching small children attack his cardboard pinballs and summoned a crowd for a different entertainment. "Little ones in front, bigger ones in back," he commanded with the practiced ease of a street performer. Listeners duly arranged themselves for Matchstick's kamishibai (paper theater) performance of Sturm's wordless book Birdsong: A Story in Pictures. The audience included a police officer, whose ostensible weekend duty was to keep potentially fractious cartoonists in line. Just down the block, the thesis works of the class of 2016 were on view in the foyer of the historic Colodny Building. This former department store — whose vintage sign still hangs in the entrance — was the original home of the cartoon school. In 2011, CCS expanded into the former post office nearby. Manning a table filled with free comic books, Rainer Kannenstine said he just graduated from the Vermont Commons School in South Burlington, now lives in White River Junction and plans to attend CCS this fall. His grandmother, artist Margaret Kannenstine, roamed the crowd and smiled approvingly at some pint-size painters. CCS faculty member Jon Chad, author of Leo Geo and His Miraculous Journey Through the Center of the Earth and other graphic books, sat down at a table to autograph copies of Science Comics, in which his comic "Volcanoes: Fire and Life" appears. A line quickly formed. "Do you prefer monsters or robots?" he asked each person, and then carefully drew the chosen creature before signing his name. The original print version of this article was headlined "The Center for Cartoon Studies Celebrates a Thriving Decade"